KIT Mutations in Ocular Melanoma 2 ARUP 3 Department Introduction The prevalence of KIT mutations varies between melanoma subtypes, as defined by the site of anatomical origin. Acral, mucosal, and chronic sun damaged skin melanomas have been shown to harbor KIT mutations while non-chronic sun damaged skin melanomas generally do not since they are often characterized by BRAF or NRAS mutations. The frequency of KIT activating mutations in specific melanoma subtypes is relatively low with reports of 15% for acral, 19% for mucosal, and 17% for chronic sun damaged skin melanomas. Ocular melanoma, although a rare melanoma subtype, does account for the majority of all intraocular malignancies. Arising from melanocytes of the choroid, iris, ciliary body and conjunctiva, ocular melanomas have been reported to express KIT (CD 117) at frequencies between 63 -91%. KIT mutations, however, have only been reported in one conjunctival tumor. Given the low frequency of KIT mutations (<1%) in ocular melanoma, it is not surprisingly that recent studies have failed to demonstrate the clinical efficacy for imatinib mesylate therapy in unselected patients. As there are only limited data on the prevalence of KIT mutations in ocular melanoma, we reviewed a large series of 75 ocular melanomas including cases arising in the choroid, iris, ciliary body and conjunctiva. The frequency of KIT activating mutations and KIT protein expression was determined for each anatomical site. In addition, we also investigated the frequency of platelet derived growth factor receptor A (PDGFRA) mutations in ocular melanoma, which has not been reported to date. Materials and Methods § 75 formalin-fixed, paraffin-embedded (FFPE) ocular melanomas were selected from the University of Utah Department of Ophthalmology files. Cases were reviewed to confirm the original diagnosis and to ensure that sufficient tumor was present for analysis. § Choroidal: n = 53 § Ciliary body: n = 11 § Iris: n = 6 § Conjunctiva: n = 5 Michelle L. 2, Wallander Sheryl 2, Tripp Don § Crude DNA extract was used directly in PCR to amplify KIT exons 9, 11, 13 and 17 and PDGFRA exons 12 and 18. § Amplification and high resolution melting analysis (HRMA) were performed on the Light. Scanner 32 (Idaho Technology, Salt Lake City, UT). § Following amplification, samples were immediately melted by heating from 65°C to 95°C at 0. 3°C/sec. Normalized and temperature-shifted melting curves were compared to wildtype DNA, which was used as a negative control. § The use of human tissue for this analysis was approved by the University of Utah Institutional Review Board (#22487). and Nick 3 Mamalis Institute for Clinical and Experimental Pathology, ARUP Laboratories, Salt Lake City, UT of Ophthalmology & Visual Sciences, University of Utah School of Medicine, Salt Lake City, UT Results KIT Exon 11: Sample OM #30 § Eight of seventy-five (10. 7%) ocular melanomas contained mutations in either the KIT or PDGFRA gene. P 573 L 100 80 KIT Ref. Ex 11 Fwd OM #30 Ex 11 Fwd 20 OM #30 Ex 11 Rev 0 KIT Ref. 60 40 80 81 82 83 84 85 Ex 11 Rev 86 Temperature 100 § Only 6 of 58 (10. 3%) CD 117 positive tumors harbored KIT mutations. § One CD 117 negative tumor harbored a KIT mutation. Ex 17 Fwd 60 OM #14 Ex 17 Fwd 40 OM #14 Ex 17 Rev § One mutation each was present in KIT exon 17 and PDGFRA intron 18. KIT Ref. Ex 17 Rev Conclusions 80 20 0 81 82 83 84 Temperature 85 HRMA and sequencing results from two representative KIT mutated ocular melanoma (OM) samples. HRMA: negative controls (red), positive controls (blue), OM #30 (black) and OM #14 (green). Results % CD 117 Positive % with Mutations % Mutation + of Total CD 117 + % Mutation + of Total CD 117 - Choroidal 81. 1% (43/53) 9. 4% (5/53) 9. 3% (4/43) 10% (1/10) Iris Ciliary Body Conjunctiva Total 83. 3% (5/6) 81. 8% (9/11) 20. 0% (1/5) 77. 3% (58/75) 33. 3% (2/6) 9. 1% (1/11) 0% (0/5) 10. 7% (8/75) 40. 0% (2/5) 11. 1% (1/9) 0% (0/1) 12. 1% (7/58) 0% (0/1) 0% (0/2) 0% (0/4) 5. 9% (1/17) Exons Involved (Number of Cases) KIT exon 11 (3) KIT exon 17 (1) PDGFRA intron 18 (1) KIT exon 11 (2) KIT exon 11 (1) N/A Mutation Location Ocular melanoma subtype Mutations deduced at. Mutations identified at protein level DNA level KIT exon 11 Choroidal Iris Choroidal Ciliary body p. Val 555 Ile + p. Ser 590 Asn p. Val 569 Ile + p. Ser 590 Asn p. Asp 572 Asn p. Pro 573 Leu p. Trp 582 X c. 1684 G>A (+) c. 1790 G>A c. 1726 G>A (+) c. 1790 G>A c. 1735 G>A c. 1739 C>T c. 1767 G>A Missense/Missense Missense Nonsense Choroidal p. Arg 804 Trp c. 2431 C>T Missense KIT exon 17 PDGFRA intron 18 § KIT expression was least prevalent in conjunctival melanomas (20%) but this failed to reach statistical significance (p = 0. 641). KIT Ref. 80 § CD 117 positivity was approximately equal (82%) in melanomas of the choroid, iris and ciliary body. R 804 W KIT Exon 17: Sample OM #14 Tumor Site § There was no significant correlation between mutational status and anatomical site (p = 0. 393). § CD 117 positivity was not predictive of KIT mutational status. § KIT IHC: rabbit polyclonal CD 117 (Dako) § FFPE tumor tissue was macrodissected and DNA was extracted by overnight proteinase K digestion. 3 Davis of Pathology, University of Utah Health Sciences Center and ARUP Laboratories, Salt Lake City, UT Relative Signal (%) 1 Department Lyska L. 1, Emerson Relative Signal (%) Lester J. 1, Layfield Choroidal c. 2701+6 G>A Mutation Type at DNA level Splice site § Six of the eight mutations occurred in KIT exon 11. The high frequency of KIT overexpression in ocular melanoma has led to an interest in the use of imatinib therapy for this melanoma subtype. 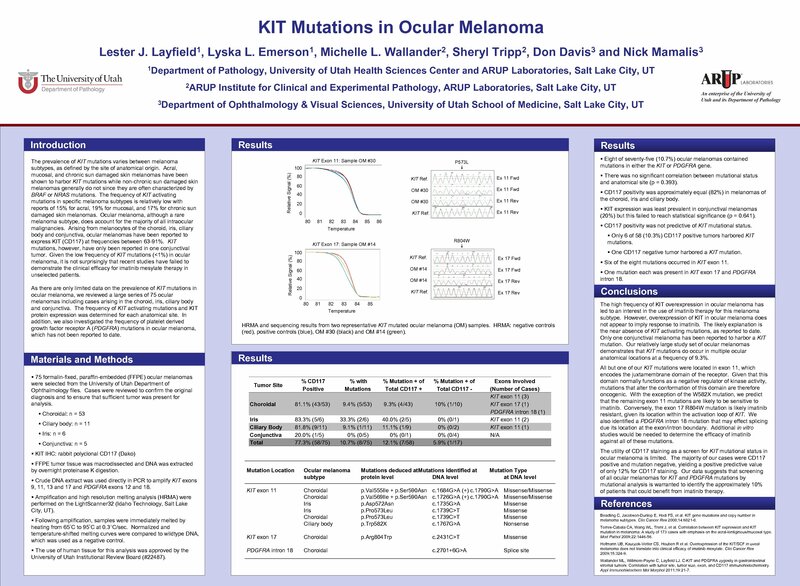 However, overexpression of KIT in ocular melanoma does not appear to imply response to imatinib. The likely explanation is the near absence of KIT activating mutations, as reported to date. Only one conjunctival melanoma has been reported to harbor a KIT mutation. Our relatively large study set of ocular melanomas demonstrates that KIT mutations do occur in multiple ocular anatomical locations at a frequency of 9. 3%. All but one of our KIT mutations were located in exon 11, which encodes the juxtamembrane domain of the receptor. Given that this domain normally functions as a negative regulator of kinase activity, mutations that alter the conformation of this domain are therefore oncogenic. With the exception of the W 582 X mutation, we predict that the remaining exon 11 mutations are likely to be sensitive to imatinib. Conversely, the exon 17 R 804 W mutation is likely imatinib resistant, given its location within the activation loop of KIT. We also identified a PDGFRA intron 18 mutation that may effect splicing due its location at the exon/intron boundary. Additional in vitro studies would be needed to determine the efficacy of imatinib against all of these mutations. The utility of CD 117 staining as a screen for KIT mutational status in ocular melanoma is limited. The majority of our cases were CD 117 positive and mutation negative, yielding a positive predictive value of only 12% for CD 117 staining. Our data suggests that screening of all ocular melanomas for KIT and PDGFRA mutations by mutational analysis is warranted to identify the approximately 10% of patients that could benefit from imatinib therapy. References Beadling C, Jacobson-Dunlop E, Hodi FS, et al. KIT gene mutations and copy number in melanoma subtypes. Clin Cancer Res 2008; 14: 6821 -8. Torres-Cabala CA, Wang WL, Trent J, et al. Correlation between KIT expression and KIT mutation in melanoma: A study of 173 cases with emphasis on the acral-lentiginous/mucosal type. Mod Pathol 2009; 22: 1446 -56. Hofmann UB, Kauczok-Vetter CS, Houben R et al. Overexpression of the KIT/SCF in uveal melanoma does not translate into clinical efficacy of imatinib mesylate. Clin Cancer Res . 2009; 15: 324 -9. Wallander ML, Willmore-Payne C, Layfield LJ. C-KIT and PDGFRA zygosity in gastrointestinal stromal tumors: Correlation with tumor site, tumor size, exon, and CD 117 immunohistochemistry. Appl Immunohistochem Mol Morphol 2011; 19: 21 -7. Програмування програмно-апар а тних засобів д.